Picture Manager For Excel v2.0 is an add-in software for Windows-based systems that provides a necessary control when working with images in Microsoft Excel. Easily automate the ability to extract, save, delete, import and embed images in bulk into Excel with just a few clicks. Existing Excel image assistant properties can quickly be applied prior to processing your images, so you do not have to spend the time it takes to administer settings to each image one by one. Also supported are the favorable sort and filter capabilities without the distress of overlapping photos. Picture Manager For Excel is not an Excel macro or VBA code snippet with one or two functionalities; it is a complete automation solution with an intuitive graphical user interface. Batch insert pictures into Excel, regardless of how you have merged the cells within your spreadsheet by selecting the images or by referencing the file name of the image somewhere on the worksheet (limit: the number of lines available in Excel). Bulk import images into Excel, regardless of how many Excel workbooks you need to populate by referencing the file name of the picture somewhere on the worksheet (no limit) or by using the Excel file name as the reference to the image (no limit). Instantly remove all pictures from Excel worksheet. Effortlessly delete all images from multiple Excel workbooks. Internet connection for setup and license activation. Download Picture Manager For Excel add-in software from the link below and run the setup for the Microsoft Office Excel version you are using. NOTE: due to limitations of Office Excel 2003 the Export function is not supported … Free evaluation version of Picture Manager For Excel does NOT insert the actual images. To unlock all restrictions on the demo software, purchase a license today and enjoy the time-saving benefits of automating your picture insertion and extraction in Excel. It is an awesome and very useful software we just started using here in the lab. We use it to import mass amounts of microscope images into our documentation software. Doality has by far made our workflow more efficient and less time-consuming. We evaluated various programs that promised to deliver the performance of what we were looking for but failed. 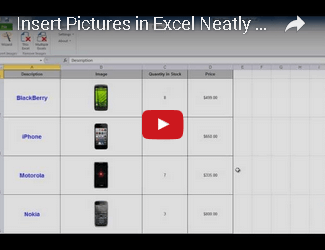 Picture Manager for Excel is the first application that has met and exceeded our expectations. Doality has greatly enhanced our reporting allowing us to insert picture in any format! Doality has saved many hours of manual work for me and our whole team. We have over 2000 products in our range and I have been putting off updating our catalogue in Excel for around 10 months due to the time it would require to edit everything and sort out the pictures properly. Doality was perfect for the job I needed and saved probably several weeks of work. Just what we were looking for! A cost effective and simple method of importing pictures into Excel, which has reduced the time it takes us to make our product catalogs by hours! Doality Picture Manager for Excel is a must have software for any company looking at making product catalogs using Excel. applications designed to help maximize efficiency and productivity of your enterprise, free to try software demo download.